IPL 2019: The Hyderabad team seems to be in a good space in the early stages of the tournament. IPL 2019: The Afghani bond was on display in the Hyderabad camp after they beat Delhi by 37 runs to go top of the points table. Rashid Khan and Mohammed Nabi seemed to be enjoying each other’s company during the celebrations after the win. Nabi was splendid with the ball as he was asked to bowl with the new ball. He did a commendable job as he scalped a couple of wickets for 21 runs in his stipulated quota of four overs. Not just that, when the team was in a spot of bother, his 9-ball 17* helped Hyderabad get over the line in a 130 chase by five wickets. It was also the fourth win in five matches at the Kotla for SRH against DC. 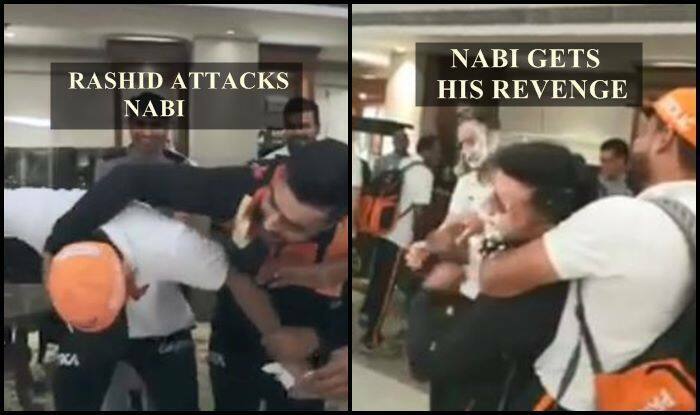 Nabi, given the responsibility of cutting the cake, was cakesmashed by Rashid after he cut the cake. It did not end there as Nabi came back to do the same to Rashid, in a way taking revenge. “Wonderful display especially by the bowlers. Everyone contributed in bowling. And Jonny was superb with the bat. The wicket was slow and we wanted to restrict them below 150. The fielders supported really well. When we lost two wickets quickly, for once DC’s collapse against Kings 11 came in my mind. But in the end Yusuf and Nabi controlled their nerves and finished really well,” said Rashid after the win.